Holly Becker's book Decorate was launched a few days ago at Liberty's in London . It looks like it was the bloggosphere event of the year, actually I don't know of any event up to date bringing together as many personalities of the world of blogs and design from all over the world. Everyone was there: Yvonne Eijkenduijn from Yvestown, Stylist Selina Lake, photographer Debi Treloar, Emily Chalmers from Caravan (super nice store in London) and author herself of the book Flea Market Style. In case there’s anyone out there who doesn’t know who Holly is (where have you been?! 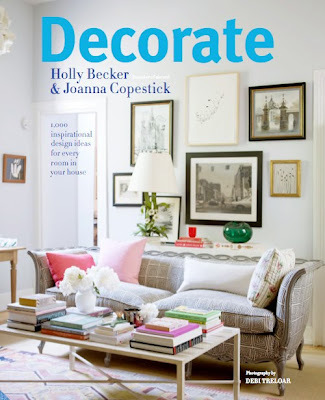 ), she is the author of Decor8, a blog dedicated to sharing fresh decorating ideas, beautiful interior spaces, independent art and design that inspires over 35,000 readers daily. 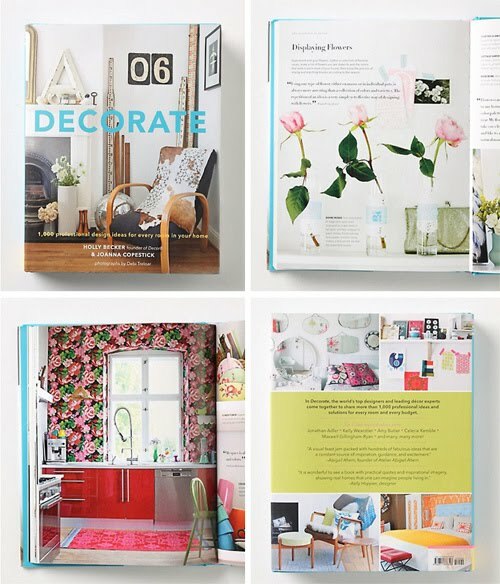 The book (with nearly 300 pages) is packed with ideas and inspiration from creatives worldwide and gorgeous photography by Debi Treloar. Stylish houses and quotes from guru designers such as Jonathan Adler, Amy Butler, Rita Konig (ex editor of Domino Magazine) and Anita Kaushal author of my favorite book The Family at Home. A directory in the back guides you through the best of interiors accessories, art, design, furniture, and a must-read list pointing out some of Holly's favorite blogs. 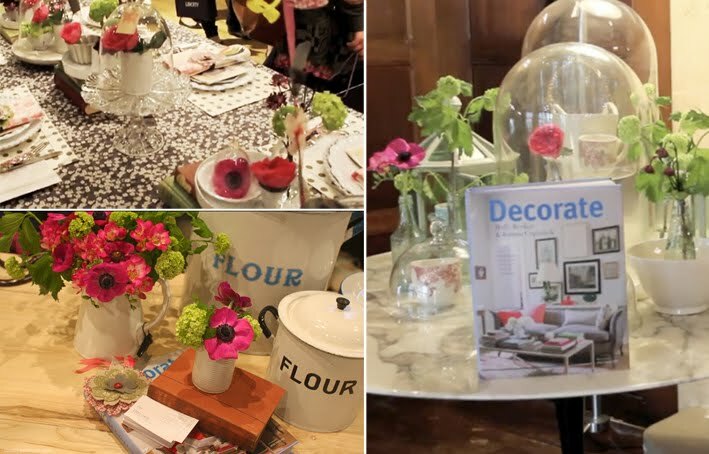 The event was hosted at Liberty’s new kitchen and dining department, what a lovely place to have your book launched! 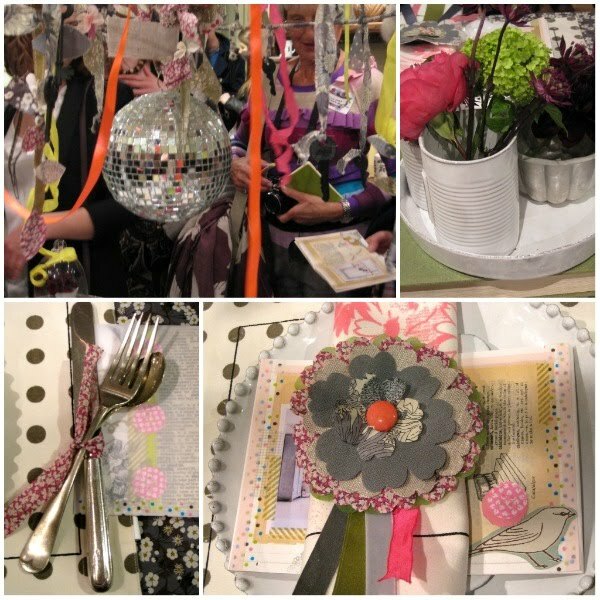 Holly and Leslie (from a creative mint ) styled a dining table for the event, the center piece is an old lampshade with a disco ball, fabric scraps and old keys. Natural flowers were displayed in glass bottles, old jelly jars and ceramic vessels that look like tin cans. They also used old books and vintage cake stands. Notice the tablecloth was made with Mitzi Liberty Tana Law fabric (the same I use for the banner of my blog). If, like me, you are wishing you had been there, you can get an idea of what the event was like on this video.